Rakusan did not include the Fan Series in his main sequence numbering. Therefore, the original number used for each of the 36 Series prints has been modified to identify the Fan Series members of its theme. The five different fan silhouette shapes have been here assigned arbitrary numbers 1 through 5. To indicate a fan design these shape designations are added to the 36 Series number separated by a hyphen. In themes which contain duplicated fan shapes, one has been arbitrarily designated A and the other B. 106-3 indicates that this is a Fan Series design with fan shape 3 in the 106 Quince theme. Like all other designs in this series, 106-3 was only produced in a single print run, and few copies are currently documented. 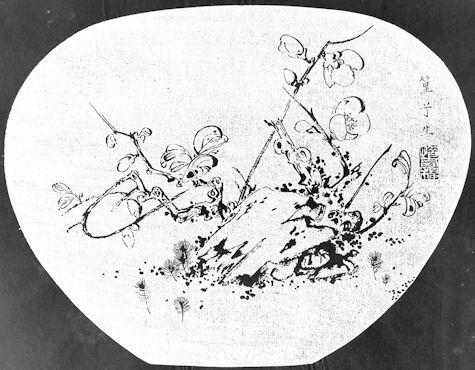 The composition of 106-3 shows an entire, small quince bush trained as a bonsai. The technique is a combination of simple line drawings for the flower, buds, and thorny stems; with additional shading on the leaves and main trunk. The ground surface is suggested by groups of dots. Other similar dots halo some of the trunk and stems. Surrounding the quince are seven tiny pine seedlings rendered as minimal line drawings. The general name for all kinds of pine trees, Pine, Pinus, spp. is 松, まつ, マツ, matsu. 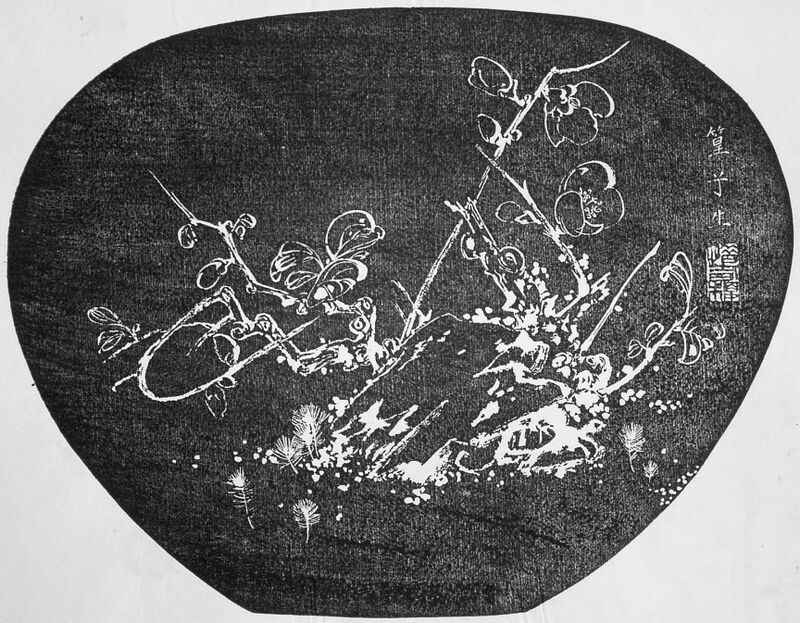 It is impossible to identify the exact species of pine that Rakusan intended to show in this design since the plants are all small seedlings.